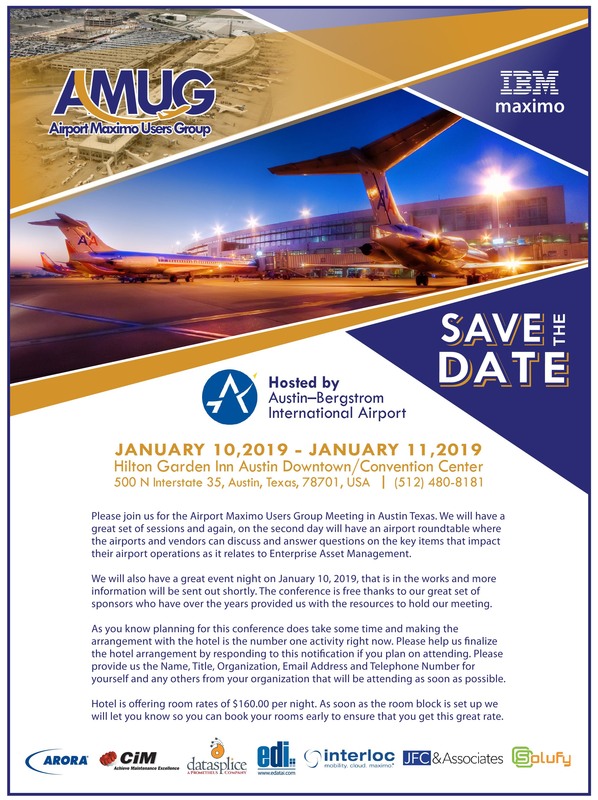 We will have a diverse mix of interesting sessions and, once again on day 2, we will hold an airport roundtable where the airports and vendors can discuss and answer questions on the key items that impact their airport operations as it relates to Enterprise Asset Management. We will also be hosting an exciting event night on Thursday, January 10th, that is in the works and more information will be sent out shortly. The conference is FREE. Special thanks to our amazing sponsors who have provided us with invaluable resources to hold our meetings throughout the years. Your Name, Job Title, Organization, Email Address and Telephone Number for yourself and any others from your organization that will be attending to zcieslak@edatai.com. The Hilton Garden Inn Austin Downtown Hotel is offering room rates of $160.00 per night. As soon as the room block is set up, we will alert you so that you can book your rooms early to ensure that you get this special discount rate. We are excited and look forward to seeing you there!